I have always been obsessed with window styling and visual merchandising, admiring the creative and conceptual installations of various window fronts and department stores. For me, nothing compares to Hermès installations, which have long been considered as the leaders in creating beautiful windows that are not only visually stunning but also tell a story. I have been lucky to view many of their windows both in Australia and overseas, and for their latest unveiling in Melbourne, Hermès collaborated with Bangkok based street artist Mue Bon. 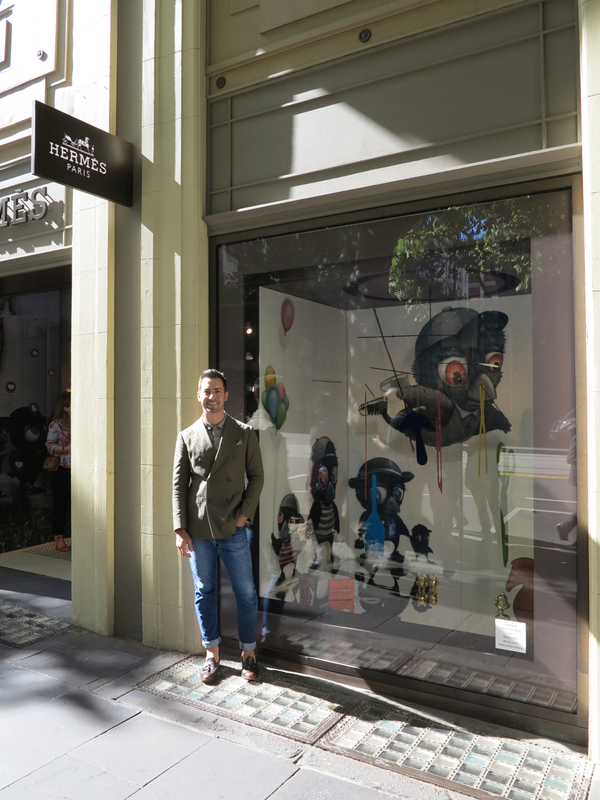 Mue Bon took his street art, cartoon like visuals to the front window of Hermès on Collins street to create a colourful, whimsical window incorporating a beautiful mobile of Hermès ‘tools of the trade’ to incorporate the Hermès at Work exhibition at the Melbourne town hall. The Hermès porte-cochère was transformed into a graphic artist laneway with Mue Bon’s work embellishing the walls, while interactive, hyper-reality app Eye Jack made PUKRUK the lovebird (one of Mue Bon’s graphic characters) come to life. After the unveiling of the windows, I was invited to the launch of the Hermès at Work at the Melbourne town hall. On until the 17th March, Hermès at Work showcases the incredible craftsmanship of nine various Hermès artisans, with demonstrations of how they handcraft products from bags, gloves, saddles, jewellery, watches, ties and more. This may have been one of my favourite exhibitions as I have long admired Hermès for not only their beautiful products, but also the meticulous detail that goes into creating each piece. The evening was topped off by a stunning performance by the Melbourne symphony orchestra – combining craftsman’s not only of product but also music – the perfect evening of bespoke proportions.